Insanity Clicker is a brand new endless clicker type of game that was recently released on Steam and its gory approach with monsters and illnesses and scary minions to help you destroy enemies that seem to have spawned from hell, make it extremely appealing to many people, myself included. I found myself playing the game for hours each day and now I am here to share with you some Insanity Clicker cheats & tips to help you progress faster. Because, yes, there is a lot more about this game than it appears at fist and there’s a lot you can accomplish. So if you want to learn about Amnesia, Sins, Illnesses but also how to progress through the levels a lot faster, read on my strategy guide filled with Insanity Clicker tips and cheats to help you get going. In case you just started playing the game, you should know that in Insanity Clicker you will progress until progress will become very slow, then reset your progress and start over, but with added bonuses that make things everything easier: on your second run, you will be able to get ever further, then reset to start over stronger than before and ready to progress, again, even further. This is the game’s mechanic. There are 9 skills that you will unlock once your minions reach certain levels, and you should always micromanage them smartly and keep most of them for boss battles. Skills 4, 5 are money-related, and I would always use them as soon as I have the chance, while skill number 8 doubles the effect of the next skill you use, meaning that you can also use it to boost your damage even more or increase the money you get – it’s your choice, but I would personally keep it for that difficult to kill boss. Well, not like forever, but take long breaks and return. I only played 6 minutes on my first run during a break at work, then forgot about the game and only reopened it 24 hours after and there were close to 500k teeth waiting for me. Progress from that moment one was extremely easy and I was cruising through the levels for a while. So don’t think that the more time you spend in the game, the better – on the contrary! As soon as progress seems to be slow, take a break for at least a couple of hours and come back later after the money piled up and you can take on the more powerful monsters. You will naturally upgrade minions and unlock them starting with the cheaper ones and then continuing with the more expensive ones. Hover your mouse over the Level Up button on each minion and see how much damage they cause: you also get a percentage of the total damage, and that is really important. Cobra, for example, which is the first minion you unlock, will soon become obsolete and with upgrades of your better minions, will deal 1% or less than the total damage. That’s the time when I will stop upgrading that minion and focus on others. But make sure that before you start ignoring minions, you have unlocked all their skills (most of them stop getting new skills at level 100) as skills are important to boost your damage, including click damage. When you Amnesia, you basically reset your progress and start over. 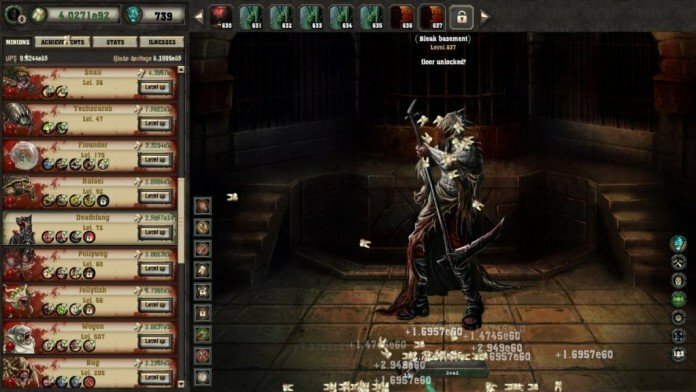 The first time you should Amnesia at level 100 (or go as far as 150 if you can) in order to get the most in terms of Sins, which not only boost your stats, but also can be used to level up illnesses. The first time you Amnesia, you should unlock all illnesses since they are free and keep your Sins intact for the extra DPS (maybe level up Bulimia and Delirium once or twice, but nothing else). Progress to a level greater than 150 this time and Amnesia again. The point is to get as many Sins as possible each time you reset your progress and keep as many Sins as possible in order to increase your DPS so always do the math and decide if its better to upgrade the Illnesses or keep the sins for the added bonus. These would be for now our Insanity Clicker tips and tricks. Do you have other strategies that fellow players might find useful? Let us know by commenting below!